I have been waiting for a long time to write about this great news. Since bug #488270 has been fixed in Firefox 3.6 (beta), Firebug 1.5 (beta) uses a new API to measure timing of underlying network activity more precisely. Firebug now uses a component called http-activity-distributor that allows to register a listener and get notifications about various phases of each network request (DNS Lookup, connecting, sending, etc.). The most important thing is that one of the parameters passed to the listener is a time-stamp. This is something what was missing till now. Firebug Net panel now fixes this problem and the timing info is correct. See couple of examples I have analyzed when testing with a nice online tool called Cuzillion developed by Steve Souders. Inline scripts block downloads and any resources (e.g. images) below an inline script don't get downloaded until the script finishes execution. Let's imagine a page with following structure. Here is a timeline of such page displayed in Firebug. The first image resource.cgi starts downloading immediately after the page itself is downloaded. The second image resource.cgi starts downloading after 5 sec delay caused by the inline script. Try the example online. The green area represents connecting time an the purple area represents waiting for response time. The blue line shows when DOMContentLoaded event was fired and the red line is associated with page load event. See how the timeline looks like for a page that loads 8 images. See the last two images. These are waiting in a queue (light brown area) till there is a free connection. The 7th image starts downloading as soon as the first image finishes and share the same connection (see, there is no green connection time). Similarly, the 8th image starts when the 2nd is completed. Try the example online. So excited to see this. In most cases, the UI blocking isn't an issue. 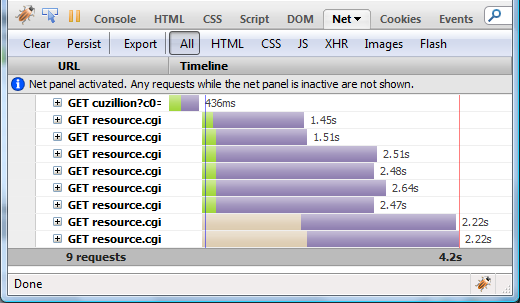 But occasionally I work with pages that have a lot of JS that used to block net panel and produce inaccurate timings. This is a great fix. HAR should be replayable. It seems to me like this would be a natural Firebug functionality. a) right-click on a request in Net panel and say "replay" or "send again"
@Jakub: Agree, this would be very useful. I recall that somebody already requested this feature. Thanks for the link to Tonda's post! #10 ~robcee/ – Firebug 1.5: New Features Revealed! Do you know the receiving times so different? I'm trying to get consistent timing results so I can measure my improvements to the css file (like removing whitespace). thanks! @Jeanne: My first recommendation would be to use Firebug 1.5 + Firefox 3.6 (an important bug was fixed in Fx 3.6 and the timing in Firebug is much more precise). Do you use this configuration? Yes, I'm using Firefox 3.6Beta4 and Firebug 1.5x.0b5. Cool. The Waiting time increase seems to be rational - after you clear the cache the CSS file has to be downloaded again and the response can take more time. As far as the Receiving time is concerned, I would expect bigger number (after clear cache), but it could happen that the cache read takes more time than the actual download. Do you have an online test I could try? I go to Firefox's Options->Advanced->Clear Now. Press Ok, then refresh the browser, and I do this same thing over and over and over. The minimal-desktop-*.css file's NetPanel Receiving times bounce all over: 15ms, 0ms, 0ms, 172ms, 125ms. What is this Receiving number? Is it the amount of time the browser takes to fully receive the file, but not apply all the css rules to the page? Or does it include applying the css rules to the page (I'd like to measure both somehow). And I'd like the measurements to be consistent, but I don't know how to do this. Thanks! The Receiving number is elapsed time the browser needed to download a response. If I load the page the first time (cache empty) I see that about 100-200ms was needed to download the css file. When I consequently refresh the page (css coming from the cache) I always see 0 for Receiving, which make sense since the response came from the cache so - no download. Note that there are two numbers for each phase, the first number e.g. +45ms says that a phase (e.g. Receiving) started 45ms after the request originated and the second is elapsed time of the phase. The timings info doesn't cover the time spent when css rules are applying to the page. Hi, Thanks for the information. If I refresh the page without clearing the cache, I too see 0ms which I expect. If I clear the cache every time, I see varying results: 313ms, 0ms, 219ms, 157ms, 0ms, 0ms, 140ms, 187ms, 0ms, 0ms, 0ms, 156ms. What is reason these numbers vary so much? I was hoping I could use this number to test performance of my css file - smaller file should be faster, file without whitespace should be faster, etc. I don’t especially care what Mozilla does or does not support; it’s not practical for me to use anything but 64-bit builds. When things don’t work I file bugs. Are you saying that there is nothing that Firebug does that *should* break on a Gecko runtime built with 64-bit pointers? Have you filed bugs on what does break? @mhunter: Not sure how 64-bit build problems is related to this post. Anyway, I am personally not using 64-bit Firefox build so, I don't have any test case (if you do, please report it). And yes, there is nothing that Firebug does that should break on 64-bit build. 2 DergiLand: Do u personally have filed bugs?